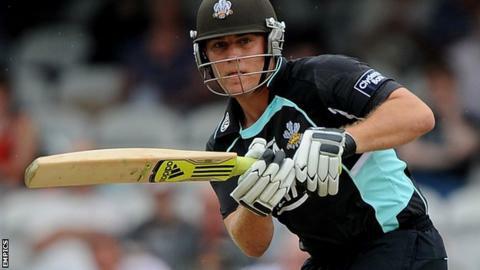 Rory Hamilton-Brown has said the death of his friend and Surrey colleague Tom Maynard was instrumental in his decision to rejoin Sussex. He told BBC Sussex: "A large part of it was there were many memories of Tom there. It was always going to be tough. "I've reprioritised what I want out of life. Number one was that I want to be happy. And I have very fond memories of playing here [at Hove]. Hamilton-Brown left Sussex to take up the Surrey captaincy in 2009. And last year, he led the Oval side back into the first division of the County Championship. However, following Maynard's death in June, he took compassionate leave from the game before resigning the captaincy in August and then leaving the club earlier this month. He said: "I look back on my years as captain of Surrey with great pride but that's a chapter of my life that is now finished. I'm looking forward to coming back to Hove and picking up where I left off. "This was the club I wanted to come to. Both parties felt it would be a good move." Hamilton-Brown added that the good memories of his earlier time with Sussex was also important to his decision. "A lot of the guys I played with before are now senior members in the side. "It's exciting; there's a good age range in the side and a lot of exciting cricketers. I'm looking forward to hopefully playing a part in taking the side forward," he said. "There is a very homely and loyal feeling (here) and that is something that's had an impact on the decision I've made because that loyalty is something you really treasure. "I hope to have a good winter and get myself ready technically, physically and emotionally, ready to have a big impact on a season where I think Sussex can challenge (for trophies)."